The War of 1812 was a defining period in the early history of Tennessee. For the first time, Tennessee was thrust into the national spotlight through its military and political prowess. When war was declared on Great Britain in June 1812, it was a Tennessean, Congressman Felix Grundy, who was given the lion’s share of credit (or blame) for steering Congress toward a declaration of war against one of the mightiest military powers of the day. Grundy, a Nashville lawyer, along with a group of Democratic-Republicans known as the War Hawks, provided the rhetoric necessary to lead the nation into a conflict that many considered unpopular. Tennessee’s accomplishments on the battlefield during the Creek War (1813-1814) gave the country something to cheer about in a period of otherwise dismal campaigns against the British. And, of course, Andrew Jackson’s stunning victory at New Orleans showed the world that the United States was coming of age and could take its place among the nations of the world. At the onset of the war, the theater of operations was concentrated on the Canadian-American border. Tennessee, eager to get into the fray, offered its services to the government; but distance prevented the state from making any direct contribution. However, when President James Madison called on Tennessee to help defend the "Lower Country," Tennesseans volunteered en masse, earning the nickname "The Volunteer State." Tennessee Governor Willie Blount was asked to send 1,500 troops for the defense of the lower Mississippi region and an expedition under the command of Andrew Jackson, major general of the Tennessee militia, was outfitted in December 1812. The troops were mustered in at Nashville on 10 December 1812 and departed in early January 1813. The expedition consisted of two volunteer regiments, under Colonels Thomas Benton and William Hall, and one regiment of volunteer mounted gunmen under Colonel John Coffee. Coffee’s men rendezvoused at Columbia, Tennessee and marched overland into the Mississippi Territory (now the present-day states of Alabama and Mississippi). The rest of the expedition comprised a flotilla that went down the Cumberland, Ohio, and Mississippi Rivers, camping at their final destination near Natchez in mid-February 1813. After lingering there for several weeks, Jackson received orders from the Secretary of War that his services were no longer required and that he was to dismiss his troops. An angry and frustrated Jackson decided to march the army home at his own expense and, by his determined stance, acquired the sobriquet "Old Hickory" along the way. Many of the men who were part of this expedition were called to join the first campaign of the Creek War in September 1813. A journal of the Natchez Expedition can be found in John Spenser Bassett, ed., The Correspondence of Andrew Jackson - Volume I (Washington, DC, 1926). For years southerners looked at the commercial possibilities of Florida (then under the sovereignty of Spain) and the strategic ports located there. Weak Spanish control allowed the Americans to anticipate a day when the territory would come under the domain of the United States. In 1812 a movement begun by Georgia "patriots" to gain control of East Florida caught the attention of Colonel John Williams of Knoxville. Williams organized a regiment of East Tennesseans to join the Georgia troops in an undertaking that, on the surface, was designed to track down marauding Creek and Seminole Indians based in East Florida. Hostility toward the Florida Indians was due, in part, to the fact that they received and harbored large numbers of runaway slaves. With a contingency of about 165 mounted men, Williams crossed the St. Mary’s River (the boundary between Georgia and Florida) and joined elements of the U.S. Army, led by Lieutenant Colonel J.A. Smith, and some Georgia volunteers in early February 1813. The expedition saw little action and garnered few results: the American army managed to destroy a few Seminole towns and capture some livestock. Casualties among the Tennesseans amounted to one killed and several wounded. The United States, fearing a war with Spain, ordered the troops to disband in March 1813. With the abortive campaigns of Natchez and East Florida behind them, Tennesseans looked for another opportunity for military conquest. It came with the onset of the Creek War (1813-1814). For most Tennesseans who fought in the War of 1812, the Creek War was the War of 1812. The battles that Andrew Jackson fought in this conflict brought him national attention and provided the experience necessary to successfully fight the British at New Orleans. 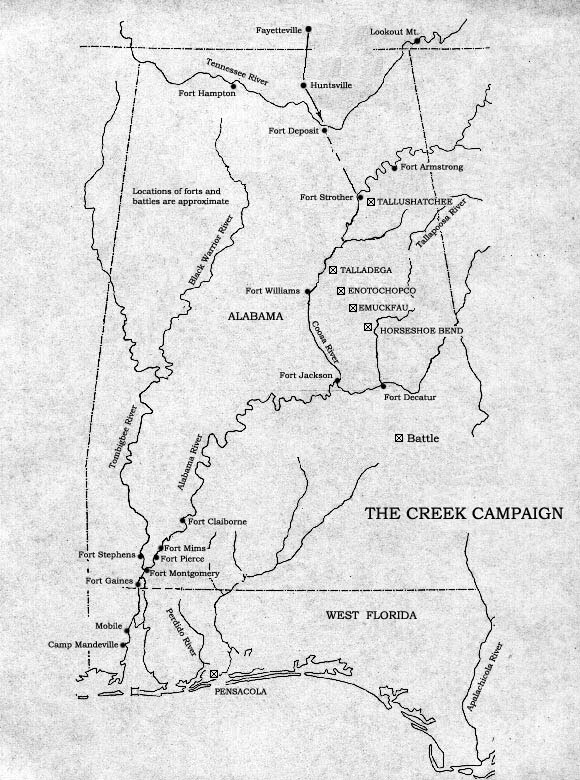 For years the Creeks (or Muskogees as they are sometimes called) had been subjects of a government plan to "civilize" the southeastern tribes through the introduction of new economic and political institutions. This process involved a departure from a hunting-and-gathering society to one based on agriculture. It also meant the dismantling of clan rule within the tribe to be replaced by a national council established by white Indian agents. These concepts threatened the old order of Creek society and fomented a religious controversy within the tribe who saw their native ways being replaced by the ways of the white man. Just as important, the Creeks felt threatened by the influx of settlers to the Mississippi Territory. In 1811, a visit to the Creeks by the famed Shawnee chief, Tecumseh, ignited the controversy about how to deal with white encroachment. Tecumseh’s dreams of an Indian confederacy advocated the rejection of white culture and a return to the "old" ways. While some Creeks adopted this stance, there were many that felt opposition to white society would lead to disaster and, hence, this faction was labeled pro-white by the followers of the nativist movement. A civil war broke out between the two sides, which soon spilled over into the frontier population of the Southwest. At Fort Mims (in the vicinity of Mobile, Alabama) the warring faction of the Creeks, known as Red Sticks, slaughtered over 250 men, women, and children (composed of mixed-blood Indians and whites) in late August 1813. This event spread panic and fear throughout the Southwest, a region with a long history of Indian warfare. In response to this alarm, the Tennessee legislature called for 3,500 troops to quell the threatening Red Sticks. In the back of the minds of many Tennesseans (especially land speculators) was the thought that a military victory over the Creeks would lead to an acquisition of the long-coveted lands the Indians possessed. Tennessee troops under Andrew Jackson rendezvoused at Fayetteville, Tennessee in early October 1813 for their first excursion into Creek territory. This army of 2,500 men marched to Huntsville (Alabama), crossed the Tennessee River at Ditto’s Landing and established a supply base nearby named Fort Deposit. They next penetrated the rugged terrain of enemy territory and began construction of Fort Strother on the Coosa River at a spot known locally as the Ten Islands. Fort Strother became the main rendezvous point for the American armies during the Creek War. Less than fifteen miles from Fort Strother lay the Creek village of Tallushatchee, where a large body of Red Sticks had assembled. Jackson ordered General John Coffee, along with a thousand mounted men, to destroy the town. On the morning of 3 November 1813, Coffee approached the village and divided his detachment into two columns: the right composed of cavalry under Colonel John Alcorn and the left under the command of Colonel Newton Cannon. The columns encircled the town and the companies of Captain Eli Hammond and Lieutenant James Patterson went inside the circle to draw the Creeks into the open. The ruse worked. The Creek warriors charged the right column of Coffee’s brigade, only to retreat to their village where they were forced to make a desperate stand. Coffee’s army overpowered the Creeks and quickly eliminated them. Coffee commented that "the enemy fought with savage fury, and met death with all its horrors, without shrinking or complaining: no one asked to be spared, but fought as long as they could stand or sit." One of the Tennessee soldiers, the legendary David Crockett, simply said: "We shot them like dogs." The carnage ended in about thirty minutes. At least 200 Creek warriors (and some women) lay dead and nearly 100 prisoners, mostly women and children, were taken. American losses amounted to five killed and about forty wounded. 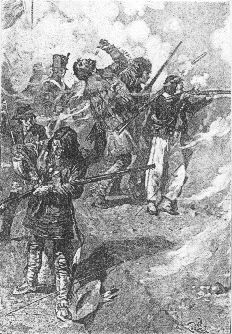 Shortly after Coffee’s detachment returned to Fort Strother, Jackson received a plea for help from a tribe of allied Creeks at Talladega, who were besieged by a contingency of Red Sticks. Jackson responded to the call by mobilizing an army of 1,200 infantry and 800 cavalry and set out for the Creek fort at Talladega, arriving there in the early morning of 9 November. Using the same tactics that had worked at Tallushatchee, Jackson surrounded the town with a brigade of militia under General Isaac Roberts on the left and a brigade of volunteers led by General William Hall on the right. A cavalry detachment, under Colonel Robert Dyer, was held in reserve and an advance unit, led by Colonel William Carroll, was sent in to lure the Red Sticks out into the open. When the Creeks attacked the section of the line held by Roberts’ brigade, the militia retreated allowing hundreds of warriors to escape. The gap was quickly filled by Dyer’s reserves and Roberts’ men soon regained their position. Within fifteen minutes the battle was over. At least 300 Creeks perished on the battlefield while American losses amounted to fifteen killed and eighty-six wounded. Jackson marched his troops back to Fort Strother to attend to his wounded and obtain desperately needed supplies. Cocke’s East Tennesseans found their "glory" at the village of a Creek tribe known as the Hillabees. On 18 November, a brigade under the command of General James White and a force of allied Cherokees, led by Colonel Gideon Morgan, surrounded the village. Unbeknownst to the attacking army, the Hillabees had been in communication with Jackson the day before to discuss surrender terms. On the day of the battle, Jackson sent a message to General White informing him of the peace negotiations, but it arrived too late. The surprised Hillabees were assaulted by the Americans and Cherokees (the Cherokees doing most of the actual fighting) and, in a matter of minutes, nearly seventy Hillabees lay dead. Approximately 250 women and children were taken prisoner. There were no American casualties. The Hillabees felt betrayed by the Americans and, consequently, became their fiercest opponents for the rest of the war. The victories won by the Tennessee armies in November 1813 were offset by the "mutiny" of Jackson’s army in December. A dispute arose between Jackson and his volunteers, who claimed their one-year’s enlistment was up on 10 December. The controversy stemmed from the Natchez Expedition -- at that time (10 December 1812), Jackson’s men volunteered for a one-year period of enlistment. They were dismissed in April 1813 and called up again at the onset of the Creek War in September 1813. Jackson felt that the time not spent in the field did not apply to the year's enlistment, but the volunteers felt otherwise. Despite Jackson’s implorations and threats, most of the volunteers left for home in December 1813. In addition, the militia units that enlisted in September 1813 for three months were at the end of their term. Even the arrival of General John Cocke’s East Tennessee troops failed to alleviate the situation, as their enlistments were also about to expire. Faced with the prospect of not having a substantial army, Jackson was advised to give up the Creek campaign until the spring of 1814. But Jackson was resolute in his determination to go on, even with a skeleton force. In January 1814, two regiments of sixty-day volunteers from West Tennessee arrived at Fort Strother. Jackson quickly utilized these green, raw troops, led by Colonels William Higgins and Nicholas Perkins, in his efforts to subdue the warring Creeks. This small army would encounter some of the fiercest fighting of the Creek conflict. On the evening of 21 January 1814, Jackson and his volunteers (about 900 men) camped within three miles of a Creek stronghold at Emuckfaw Creek on the Tallapoosa River. Around midnight, Jackson’s spies reported that the Creeks were aware of the American army’s presence and were making preparations to attack. Shortly before dawn of the 22nd, the Red Sticks struck the left and rear flanks of Jackson’s camp but were repulsed. At daylight, Jackson’s troops charged the retreating Creeks, killing scores of them. Jackson ordered General Coffee to take a detachment to destroy the nearby Creek camp, but Coffee found the Creeks too well fortified to assault (this was the same site that Jackson later attacked at Horseshoe Bend). About thirty minutes after Coffee’s unit returned, the Creeks made a second attack on Jackson’s army by assailing the right wing as a feint for the main attack on the left. Coffee counter-attacked with dismounted troops and was wounded in the process (his aide and brother-in-law, Major Alexander Donelson, was killed). On Jackson’s left, Colonel William Carroll was ordered to repulse the Creeks, which he managed to do successfully. Meanwhile, reinforcements came to Coffee’s aid and, once again, the Creeks were put to flight. Jackson decided to march his beleaguered army back to Fort Strother and stopped at Enotochopco Creek on 23 January, throwing up breastworks in anticipation of another attack by the Red Sticks. The night passed uneventfully and, on the morning of 24 January, Jackson resumed his march to Fort Strother. The army moved in three columns: the regiment of Colonel Nicholas Perkins on the right; the regiment led by Lieutenant Colonel Frederick Stump on the left; and Colonel William Carroll commanding the rear. As the advance units of the army were crossing Enotochopco Creek, the Creeks attacked the rear of Jackson’s army. The rear guard fled, spreading panic throughout the ranks, while Colonel Carroll was left with a handful of men to stave off the attacking Red Sticks. Lieutenant Robert Armstrong and a few members of his artillery company, known as the "Nashville Volunteers," managed to maneuver their artillery piece to a small eminence near the creek, where they fought off the Creeks in hand-to-hand combat. Armstrong fell to the ground wounded, imploring his men to "save the cannon." Several others fell beside him, but they bought valuable time for Jackson to regroup. Jackson and the already-wounded Coffee rallied the broken columns of the army as small groups of men began to reach the artillery post. Captain John Gordon’s company of spies re-crossed the creek and bore down on the left flank of the attacking Indians. The Creeks were finally routed and fled with Jackson’s pursuing army close behind, killing what retreating Creeks they could. At both Emuckfaw and Enotochopco, Jackson claimed to have killed 189 Creek warriors, insisting the figure was probably higher. American losses amounted to twenty killed and seventy-five wounded (a complete list of American casualties can be found in the Nashville Whig of 8 February 1814). Jackson dismissed most of his army in February 1814, as new enlistments were expected to take their place. Along with the new enlistees from East and West Tennessee, a regular army unit, the 39th U.S. Infantry, under the leadership of Colonel John Williams, was ordered to join Jackson. Jackson was ready to resume the Creek campaign by mid-March, after amassing an army of about 5,000 troops along with adequate supplies. A large segment of Jackson’s army left Fort Strother on 14 March 1814 and traveled sixty miles to a point on the Coosa River, where a garrison was established and given the name Fort Williams (in honor of Colonel John Williams). Preparations were made to march about fifty miles in a southeasterly direction to the Creek stronghold called Tohopeka (known to the whites as Horseshoe Bend). The Creeks occupied an hundred-acre section of land in the U-shaped bend of the Tallapoosa River, fortified by an elaborately-constructed breastwork of logs that reached from one side of the river to the other. Behind the fortifications were nearly a thousand warriors and a village, located at the bend of the river, of their families. The fact that the Creeks did not remove the women and children from the site, as was their custom prior to battle, indicated that they either felt secure behind the fortifications or that any battle would be a fight to the finish. Jackson’s force, after leaving adequate troops to man the various forts in the territory, amounted to about 3,000 men. The army reached Tohopeka in the early morning hours of 27 March. General Coffee and his brigade of mounted gunmen, along with a contingency of Cherokees and allied Creeks, were dispatched to cross the Tallapoosa about three miles below Tohopeka in order to surround the Creeks and prevent any chance of escape. Jackson marched the bulk of the army to the front of the Creek stronghold. Around 10:30 a.m. Jackson’s two artillery pieces began to fire at the fortified wall of the Creek breastworks, but the cannonade proved to be ineffective. By noon, Jackson determined that the works would have to be taken by storm. At about the same time, impatient Cherokees under Coffee began to swim the Tallapoosa to capture the canoes the Creeks intended to use as a means of escape. Using the captured canoes, the Cherokees and some of Coffee’s men managed to cross the river and assail the Creeks from the rear. Jackson’s assault on the breastworks, led by the 39th U.S. Infantry and Tennessee militia, proved successful after a brief, but severe, contest. As the Creeks found themselves being attacked from the front and behind, the fortifications they had placed so much faith in became their graveyard. The battle soon took on the aspects of a massacre as the Creek warriors asked for no quarter and fought with savage desperation. The slaughter continued until nightfall and, at the end of the day, 557 Red Sticks lay prostrate on the field of battle. Hundreds more were killed by Coffee’s men as they tried to make their escape by crossing the Tallapoosa River. In all, nearly 900 warriors are said to have perished in what is considered to be the most devastating defeat of Native Americans in North American history. The official tally of American casualties was 32 killed and 99 wounded -- the friendly Indians lost 23 killed and 47 wounded. A list of American killed and wounded can be found in the Nashville Whig (11 May 1814). After the defeat at Horseshoe Bend, bands of starving Creeks surrendered themselves during the spring and summer of 1814. In August 1814, the Treaty of Fort Jackson forced the Creeks to forfeit over 20,000,000 acres of land to the United States in retribution for the Creek War. The fact that much of this land was taken from Creeks that had allied themselves with American troops during the war made no difference to the land-hungry frontier populace. Within five years white settlers overran the region and the state of Alabama was formed. The demise of the Creek Nation had begun. As a reward for his success in the Creek War, Jackson was commissioned a major general in the regular army (May 1814). After concluding negotiations with the Creeks, he turned his attention to the regions of Mobile and Pensacola. Mobile, lately in possession of the United States, was a possible point for the British to launch a campaign against New Orleans. Pensacola, in the Spanish-held province of West Florida, became a place of refuge for the remnants of the Red Sticks who sought arms and supplies from the Spanish and/or British to renew hostilities against the Americans. Great Britain planned to use the renegade Creeks to harass the southern frontier, thus keeping American forces occupied, while operations against New Orleans were conducted. Jackson’s victory at Horseshoe Bend stymied these plans, but there were still enough fugitive Creeks in Florida to warrant Jackson’s attention. His concern was heightened when the British, along with Red Stick allies, made an attempt to capture Fort Bowyer at Mobile Point in mid-September 1814. Although the attack was repulsed, it provided an excuse for Jackson to move against Spanish Pensacola, where the British task force originated. On the morning of 7 November 1814, Jackson’s forces approached the town of Pensacola. Jackson’s army for this excursion was a smaller version of the variety of forces he later commanded at New Orleans: detachments of U.S. Regulars (the 3rd, 39th, and 44th Infantry); Tennessee militia and mounted men; Mississippi Territory dragoons; and a party of Choctaw Indians. Jackson feigned an attack on the west side of the town while taking the bulk of his army to the eastern side. Spanish resistance was feeble and the British declined to get involved, leaving the port in several men-of-wars. Losses were minimal -- five Americans killed and ten wounded -- but the effect was enormous. With one stroke, Jackson stymied the threat of British intrigue in Florida and further scattered the remnants of the Red Sticks. At the same time, he made impossible future Spanish and British cooperation. He accomplished all of this without the sanction of the United States government, which did not want to provoke hostilities with neutral Spain (Spain, although England’s ally, had never declared war on the United States). Jackson was now ready for his final destination of the War of 1812 -- New Orleans. Often referred to as the "night battle," this was the initial engagement between the British and American land forces at New Orleans. On the afternoon of 23 December, Jackson learned that a British force had made its way through the bayous to a plantation several miles south of the city. Jackson mobilized his forces and launched a daring attack at 8:00 p.m., leading the right wing (the 7th and 44th U.S. Infantry) while General John Coffee led his brigade of Tennessee mounted men on the left. The darkness of the night turned the fight into mass confusion, as friendly troops fired on each other and combat became hand-to-hand. By 11:00 p.m. the British gave ground but Jackson’s forces did not pursue, as neither side could ascertain the other’s strength. American losses were 24 killed and 115 wounded while the British suffered 46 killed and 145 wounded. The skirmish of the 23rd December had the effect of stemming the initial tide of the assaulting British forces and gave Jackson time to entrench his army. He established a line of defense along the Rodriguez Canal between the Macarte and Chalmette plantations. The line extended from the east bank of the Mississippi River more than a half-mile to a cypress swamp. On 28 December the British, under the overall command of Major General Sir Edward Pakenham, conducted a "reconnaissance in force" to test the strengths and weaknesses of what became known as Line Jackson. A combined force of artillery and infantry probed the American defenses and found that the left wing of Line Jackson was the most vulnerable. This portion of the line was manned by Major General William Carroll’s Tennessee militia and volunteers, as well as Coffee’s brigade. The inability of the English to mobilize heavier guns to the front put a halt to the attack. There were seven killed and eight wounded on the American side. As a result of the 28 December attack, Jackson fortified the left wing of his line and extended it into the woods of the cypress swamp, thus increasing its length to about a mile. Coffee’s men, along with a detachment of Choctaw Indians, held the extreme left of the line. On the first day of January 1815, Pakenham once again gave orders to assault Line Jackson. The British planned to use their heavy artillery to make a breach in the line and put the American cannons out of commission. However, American batteries, some manned by crews of Jean Lafitte’s pirates, proved to be more effective than the artillery of the British. In addition, English gunners ran short of ammunition (a problem that plagued them throughout the campaign at New Orleans). British infantry units attacked the extreme left of Jackson’s line, but were repulsed by Coffee’s brigade. The Americans lost eleven killed and twenty-three wounded. The morning of 8 January was cold and foggy. Before the sun could burn off the mist that lingered on the fields of Chalmette, a British signal rocket burst in the air and massed columns of English soldiers advanced toward the American lines. The American forces, about 4,000 on the line, opened up with their artillery and followed with a devastating volley of musket and rifle fire. The advance columns of the British army, aimed at the right flank of Line Jackson near the river and the left flank commanded by Major General William Carroll, were shattered and quickly routed. In less than two hours the battle was over. On the field lay about 1,500 dead and wounded British soldiers (another 500 were taken prisoner), including a mortally-wounded General Pakenham. American losses amounted to thirteen killed and thirty-nine wounded. How did this catastrophe for the British occur? British operations faltered from the beginning. Plans to cross the Mississippi and capture the American artillery on the west bank of the river were delayed and the attack on the main line had failed by the time the west-bank mission was accomplished. The assault on Line Jackson was uncoordinated and rife with mistakes, perhaps the biggest being the British underestimation of the abilities of the American militia to withstand a bayonet charge. The initial success of the British on the extreme right of Line Jackson was not supported and reinforcements were diverted to an abortive attack on the center of Jackson’s fortifications. Tennesseans, many of whom had seen action in the Creek War, repulsed the British regulars with a deliberate coolness and confidence hitherto not encountered by attacking British forces. Deadly American artillery fire, combined with the rifle and musketry, proved too much for the exposed English troops marching across the plains of Chalmette. Much has been made of the fact that the Battle of New Orleans was fought after the Treaty of Ghent was signed (24 December 1814). However, the treaty had not yet been ratified and a British victory could have complicated the peace agreement. The enormity of the victory was a huge boost to the morale of the United States, giving the impression that America had won the War of 1812, when, in fact, it could be said that the war ended in a draw. As for Jackson and his Tennesseans, they lingered in the camps at New Orleans until March 1815. Ironically, hundreds of Tennesseans who survived the rigors of battle succumbed to the deadly illnesses that permeated the camps after the battle. Jackson was proclaimed a national hero and embarked on a political career that eventually took him to the White House in 1828. The War of 1812 showed the world that the United States was becoming a power to be reckoned with, and Tennessee was instrumental in this transition. The state amassed an impressive record of service to the country’s cause through the collected effort of its citizens, as well as distinct individual efforts. The advances made by Tennesseans, however, came at a huge price paid by the ever-diminishing Native Americans of the southeast. For a good overall study of the southern phase of the War of 1812, see Frank L. Owsley Jr., Struggle for the Gulf Borderlands: the Creek War and the Battle of New Orleans , 1812-1815 (Gainsville: University Presses of Florida, 1981). An excellent comprehensive history of the War of 1812 is Donald R. Hickey, The War of 1812: A Forgotten Conflict (Urbana: University of Illinois Press, 1989). For Tennessee’s involvement in the War of 1812, see Tom Kanon, Tennesseans at War 1812-1815: Andrew Jackson, the Creek War, and the Battle of New Orleans (Tuscaloosa: University of Alabama Press, 2014). For specific details of the battle at Horseshoe Bend and its significance, see idem., “‘ A Slow, Laborious Slaughter’: The Battle of Horseshoe Bend,” Tennessee Historical Quarterly 58 (Spring 1999): 2-15. Of the dozens of biographies of Andrew Jackson, a dated but still valid contribution is James Parton, Life of Andrew Jackson (New York: Mason Brothers, 1860). Because Jackson is such a controversial figure, most biographies tend to draw biased conclusions, one way or the other, about the military legacy of Andrew Jackson. Any researcher would need to consult Jackson ’s vast collection of papers to make up his/her own mind. John Spenser Bassett, ed., Correspondence of Andrew Jackson, Volumes 1 and 2 (Washington, DC: Smithsonian Institute of Washington, 1926) is invaluable for the reports and accounts it contains on Jackson ’s military exploits. A more recent compilation of Jackson ’s correspondence, The Papers of Andrew Jackson, Volumes 2 and 3 (Knoxville: University of Tennessee, 1984), edited by Harold D. Moser, enhance Bassett’s work by including informative, detailed footnotes. The interest in the Native American experience has spawned an abundance of research into the culture of the Creek Indians. Of the many books that have been published on this subject, more than a few deserve special attention. Some of these include Joel W. Martin, Sacred Revolt: The Muskogees’ Struggle for New World (Boston: Beacon Press, 1991); Claudio Saunt, A New Order of Things: Property, Power, and the Transformation of the Creek Indians, 1733-1816 (New York: Cambridge University Press, 1999); and Robbie Ethridge, Creek Country: The Creek Indians and Their World (Chapel Hill: University of North Carolina Press, 2003).